When you see a film about how the human race being pushed aside from the top of the pyramid, you tend to see it with a sense of patriotism, you know? You say things like “yeah, if apes try to take over my neighborhood I’ll give them an a** whooping they’ll never forget” and we say it as if we’ll stand in the front line defending humanity. I had that feeling when I saw Planet Of The Apes, but when I saw this movie it was sort of inspiring, you know? The story of a particular race standing up for its beliefs, standing up for equality, and standing up for freedom! I guess all revolutions start on such pure beliefs but grow into something ugly. This movie invokes all those emotions of unity, of belonging, of being truly free. The movie starts out with a scientist from a biotechnology company Gen-Sys. Will Rodman (James Franco) is developing a drug that helps the brain repair itself, ALZ 112. Will Rodman develops it as a cure for Alzheimer’s disease, of which his father Charles Rodman (John Lithgow) is suffering from. 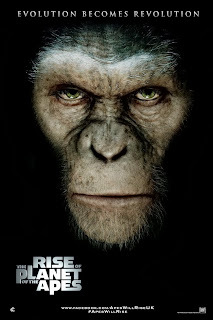 Now, this part is a bit complicated to explain plus to see it in the movie is ten times better, so, cutting it short, Caesar (Andy Serkis) is an ape born in Gen-Sys, his mother was a test subject for the drug ALZ 112, Caesar was born with ALZ 112 in his system genetically passed from mother to son, Caesar becomes a super ape. Now, you have to understand Caesar’s point of view, he’s as intelligent and as emotionally connected as any human being, the only difference being his inability to speak and the fact that he’s a monkey. As the movie progresses two things happen, Caesar realizes that he lives in a world where his own race is ill treated and abused, and ALZ 113 is developed to remove the defects of ALZ 112. What happens after this is just adrenaline pumping excitement :D Oh, by the way, keep an ear out for the most emphatic “No” you’ll ever hear. Some amazing visual effects, a great story, watch this movie and be entertained!